(Minghui.org) It takes real wisdom for people who live amidst the Chinese Communist regime’s constant barrage of lies to still be able to see things for what they are. In the many years of the persecution of Falun Gong, the Chinese regime churned out constant propaganda through its state-run media, slandering and framing the spiritual practice. Nonetheless, many people have decided to find out for themselves what Falun Gong was about and ended up finding the best thing in their lives. The following are stories of some of these bold individuals who were undeterred by the propaganda and stood strong in the face of the persecution. The couple visited Ms. Zhang’s parents, who both were Falun Gong practitioners, a few months after the persecution started. She learned that her parents had stopped practicing because of constant harassment from the local police. Her parents were so scared that they would not even mention the practice. She was pained that her parents, who were law-abiding citizens, had to suffer for trying to stay healthy. She decided to go to Beijing to protest against the persecution along with other practitioners. Along the way, she began studying the practice as well. All the state-run media began to attack Falun Gong after the persecution started. The news was especially harsh about the peaceful protest on April 25, when 10,000 practitioners went to the central government compound seeking fair treatment. The news claimed it was a planned attack on the government. Ms. Chong Jinxia from Gansu Province repeatedly watched the news and saw that no one was attacked, with the practitioners standing quietly in a line and some meditating. Ms. Chong was a part-time television news anchor and broadcaster in her company’s propaganda department. She understood how the news works in China. As the media continued to defame Falun Gong, she talked to her coworkers who used to be practitioners. She then borrowed and read the main book of Falun Gong teachings, Zhuan Falun. The teachings resonated with her, and she took up the practice. Ms. Liu Guorong retired from Bureau of Materials in Nanyang City. She was a Buddhist before the persecution. As she saw that the television news was attacking Falun Gong around the clock and that practitioners were arrested one after another, she decided to find out what Falun Gong was. Seeing that the teachings promote kindness and honesty, she realized why the communist regime attacked it, and she became a practitioner. After seeing multiple propaganda pieces against Falun Gong on television news, Ms. Li Cuifang from Gansu Province became curious. She bought a copy of Zhuan Falun and started reading it in front of her shop. A neighbor walked by and seeing that she was reading a Falun Gong book, stopped to warn her. “The police are seizing Falun Gong practitioners. Are you sure you want to be reading it?” her neighbor asked. Ms. Fang was drawn to the principles in the book as she was reading and experienced tremendous energy in her body. She felt comfortable and illness-free. “Such a wonderful book. Yes I’m reading it, why not?” she replied. She didn’t hesitate to join the practice. Mr. Qu Yanlai from Heilongjiang Province was a brilliant student and won the provincial Olympiad of chemistry and mathematics. He was accepted to one of the country’s best universities, Shanghai Jiaotong University. When the persecution began in 1999, he hadn’t finished reading the book Zhuan Falun. However, he knew that the propaganda on television was false, a tool used to incite public hatred against Falun Gong and justify the unlawful persecution. Mr. Qu, unswayed by the news, finished reading the book and became determined to follow the teachings of Falun Gong. At 3 p.m. on September 17, an international human rights workshop titled “Freedom of Peaceful Assembly” was held in the conference room of United Nations Palace of Nations. The CCP’s live organ harvesting was the focus of the seminar. Mr. Poggia issued an open letter calling for exposure and investigation of the CCP’s atrocities. While regretting that my parliamentary obligations do not permit me to be among you today, I nevertheless wish to share with you my deep dismay at seeing to what point the base economic ends of Western States towards China allows that Government to flout with impunity, with cynicism and monstrous cruelty, fundamental human rights, and primarily the first of these rights, the right to Life. There is no longer any doubt today that a massive and lucrative traffic in organs is practised with the complicity of the Chinese Communist Party, not only on those condemned to death through common law, but also on political prisoners and peace-loving Falun Gong practitioners, considered as enemies of the state, detained, tortured and executed, with international indifference, despite pleas for help sent out over the past years. Tens of thousands of individuals disappear and are detained without trial, building up a veritable reservoir of living organs, awaiting a compatible recipient to sound their execution bell. These abominable crimes must be denounced, an international commission of enquiry formed without delay, and those responsible brought to trial with the firmest determination. Every human rights violation worldwide must be fought without respite, and this is not to make a hierarchy in horror. Nevertheless, when similar atrocities, committed on such a grand scale, are on the increase in a country that cannot even claim a serious conflict situation, free human beings to which we have the good fortune to belong, have the duty to stand up and to cry out their pain insofar and as long as they are not heard. It is the suffering of these martyrs that we must hear today, but also and above all, the suffering of all those for whom we are the only voice, and without which they also risk disappearing, in the comfortable indifference of money. The intolerable is not to be tolerated! Organ transplantation is a form of live transplantation. Three technical difficulties need be solved. The first difficulty lies in the immediate vascular connection as soon as an organ is transplanted into the recipient’s body. This restoration of blood circulation is critical to supplying nutrition so that cells can stay alive. This requires a different set of surgery techniques from the stitching of regular tissues. This technique for vascular anastomosis was not developed until 1903 by Alexis Carrel, a French surgeon, biologist and eugenicist, who was awarded the Nobel Prize in Physiology or Medicine in 1912. The second difficulty is to keep the harvested organ alive after it becomes isolated. Under normal temperatures, an organ dies between a few minutes and an hour, which will prevent it from being transplanted into the recipient’s body. However, to complete the transplantation within such a time constraint is impossible. Innovative techniques are needed to keep organs alive. The solution is to lower the temperature during a process called perfusion. The lower temperature reduces the nutrition level needed by the cells, which extends the survival time of an isolated organ. Perfusion achieves nutritive delivery of blood. It was not until 1967 and 1969 that F.O. Beizer and G.M. Collins independently developed practical perfusion solutions, which could keep an isolated organ alive for 24 hours. This has gained enough time for organ transplant surgery operations. The third difficulty lies in the foreign source of the organ being transplanted. Any recipient has an inborn capability and mechanism (immune mechanism) which can recognize, control, destroy and eliminate foreign tissues or organs transplanted into the body. This physiological immune process is clinically manifested as rejection reaction, which can result in damage to transplanted organs and failure of transplantation. Transplanted organs, like other cells in a human body, are composed of two major types of antigens: ABO blood type and Human Leukocyte Antigen (HLA). Together, they determine the rejection reaction associated with homograft. There are only four ABO blood types (O, A, B, and AB). It is not that hard to match suppliers and recipients of the same ABO blood type. However, HLA is extremely complex. It has been discovered that there are seven groups of HLA. They are HLA-A, HLA-B, HLA-C, HLA-D, HLA-DR, HLA-DQ, and HLA-DP, with a total of 148 antigens. The possible permutations are well over 2,000,000. Except for twins from the same egg, it is practically impossible to locate a supplier and a recipient with identical HLA matching. As a result, rejection reaction always follows a homograft. It has to be reversed with intense immune suppression. Immunosuppressant drugs that are clinically effective were not discovered until the 1960s. They include: azathioprine (1961), prednisone (1963), anti-lymphocyte globulin (1966), and Cyclophosphamide (1971). With the advent of these immunosuppressant drugs, organs could be kept alive long enough after transplantation. In 1962, J.E. Murray, who was awarded the Nobel Prize in Physiology or Medicine in 1990, accomplished the extended survival of a human kidney transplant for the first time. It marked organ transplantation as being clinically feasible. Hyperacute rejection – Hyperacute rejection usually takes place within 24 hours of the transplant. It is the outcome of a xenotransplanted organ in non-immunosuppressed recipients. Hyperacute rejection is a particular risk in kidney transplants. This is commonly addressed by a prospective cytotoxic cross match prior to kidney transplantation to ensure that antibodies to the donor are not present. Acute rejection – Acute rejection is the most common rejection observed. It usually takes place several days to several months after the transplant. It is caused by mismatched HLA. Most acute rejection cases can be alleviated by immunosuppressant drugs. Chronic rejection – Chronic rejection usually takes place several months to several years after the transplant. It is a poorly understood process of chronic inflammatory and immune response against the transplanted tissue. The above is an article published by the website of Jiankangbao [Health newspaper]. It is an interview with Shi Bingyi, director of the Transplant Center of the People’s Liberation Army (PLA), who estimated that there had been a cumulative count of 90,000 transplant cases by 2005. This article has since been deleted from the website. 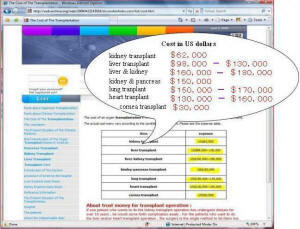 The screen capture was taken from an archive at http://web.archive.org/web/20060826070646/http: //www.transplantation.org.cn/html/2006-03/394.html. Many underground hospitals sprouted up, driven by the high profit margin. This crowded the organ transplant marketplace. Therefore, we need to point out the existence of underground organ transplant hospitals. Transplants conducted at these hospitals are likely not included in the statistics by Huang Jiefu, deputy minister of the Ministry of Public Health, and others. As a result, the number of actual transplants that took place between 2003 and 2006 could very well surpass the estimates we have discussed in previous chapters. If we transpose liver transplant cases on top of kidney transplant cases, we get the following chart, with the red line indicating the trend of changes. Note: Huang Jiefu’s data between 2003 and 2006 is based on incomplete statistics. Estimates from other experts are much higher. In fact, Huang Jiefu’s data is on the conservative side among statistics we have gathered from organ transplant experts in China. Shi Bingyi, director of the Organ Transplant Center of the PLA, estimated that there were close to 10,000 kidney transplant cases and close to 4,000 liver transplant cases in 2005 alone. 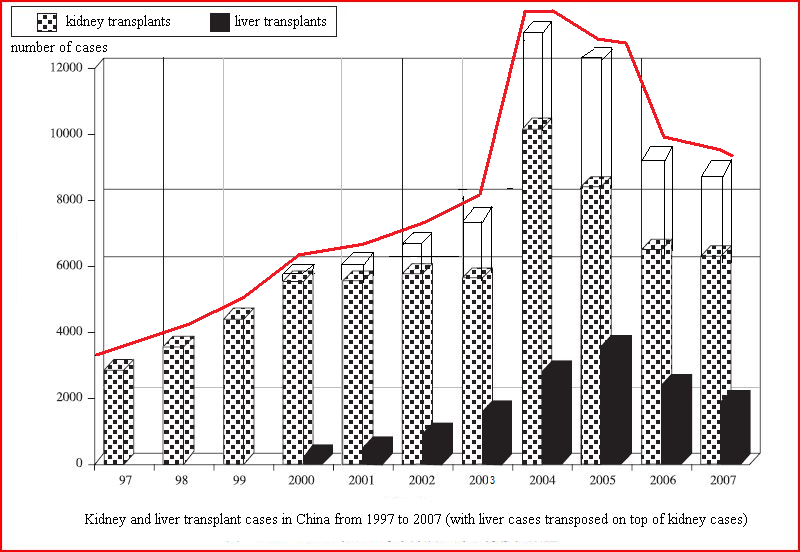 Shi Bingyi said in another interview with Science Times that the number peaked in 2006, with 20,000 transplant cases in that year. When Shi was a guest at the Xinhuanet.com in September 2009, he said that currently between 8,000 and 9,000 kidney transplant surgeries were conducted in China each year, while liver transplant surgeries were between 3,000 and 4,000 each year. 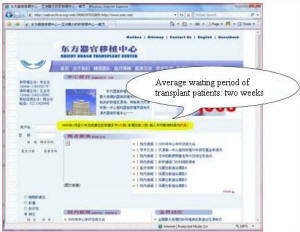 The following are average waiting periods for organs as taken from websites of Chinese hospitals. The China International Transplantation Network Assistance Center of the No. 1 Affiliated Hospital of the China Medical University in Shenyang City, Liaoning Province published answers to most frequently asked questions on its website emphasizing live organs being used in organ transplants. The Chinese text circled emphasizes that the organs are live organs. The China International Transplantation Network Assistance Center website has since been taken offline. Screen capture from an archive at: http://web.archive.org/web/20041023193430/zoukiishoku.com/cn/wenda/index.htm. 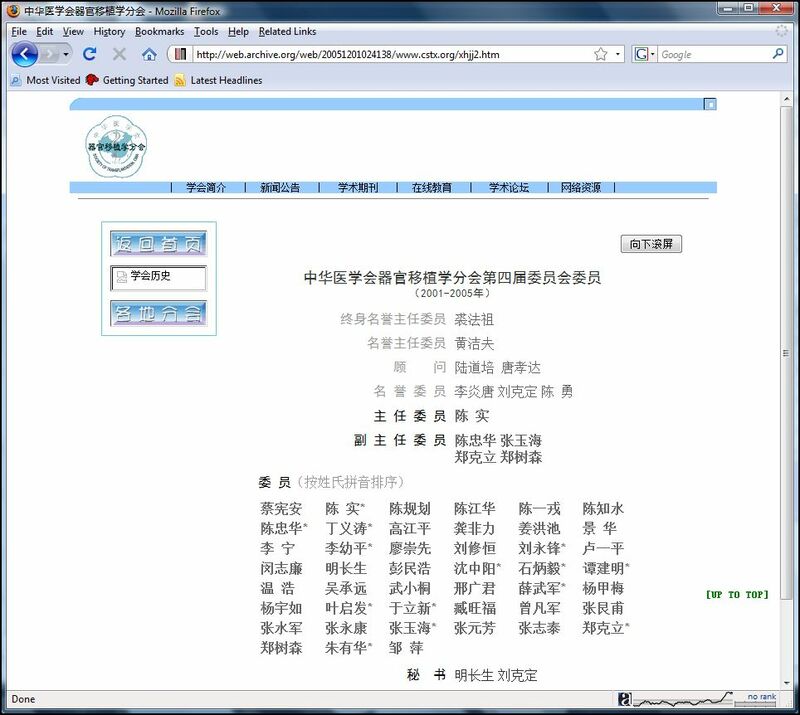 After the exposure of organ harvesting from living Falun Gong practitioners on March 9, 2006, the website of the Chinese Society of Organ Transplantation (www.cstx.org) affiliated with the China Medical Association soon disappeared. 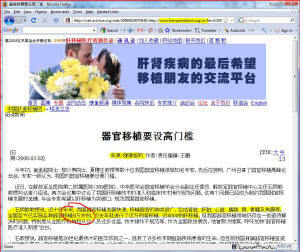 It was redirected to the website of the China Medical Association (www.cma.org.cn). As of November 2009, the cstx.org website remains offline. The Internet Archive indicates that the cstx.org website was last updated in February 2006, at which time it clearly stated that it was sponsored by the Chinese Society of Organ Transplantation and implemented by the Organ Transplantation Research Institute of Tongji Medical School of the Huazhong University of Science and Technology. The website of the Chinese Society of Organ Transplantation affiliated with the Chinese Medical Association before it disappeared. Screen capture from an archive at: http://web.archive.org/web/20051201024138/www.cstx.org/xhjj2.htm. Cover and headline “Organ deal behind the death of a beggar” of South Wind Window magazine, Issue No. 14, 2007. 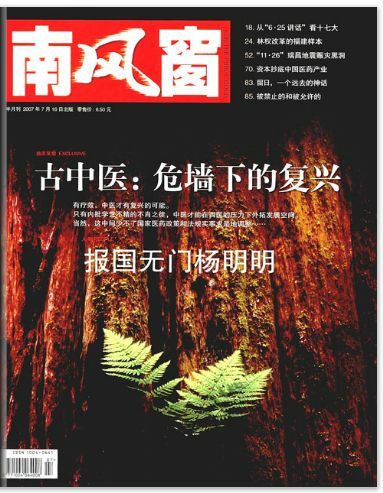 Caijing [Finance and Economics] magazine, Issue No. 18, 2009 (published on August 31, 2009), carried a cover story “Where did the organs come from?” which revealed the case of killing of a homeless person for his organs. Original link: http://magazine.caijing.com.cn/2009/cj245/ appears to be broken. 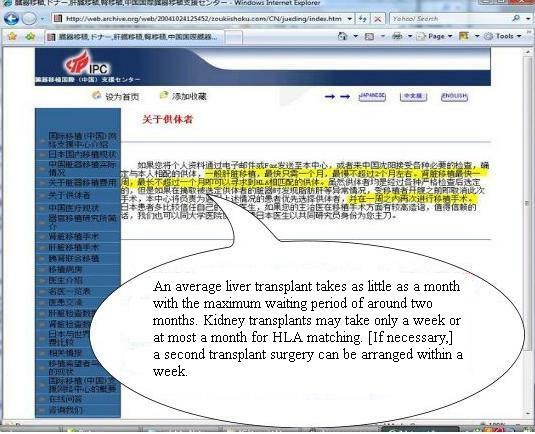 A copy of the report was also found at http://www.transplantation.org.cn/zyienizhonghe/2009-09/3906.htm. Note: Caijing magazine has been known for its courage in exposing the dark side of Communist bureaucrats and publishing sensitive news reports. However, a human resources shakeup took place in the second half of 2009, and over 150 editors and reporters, which was almost the entire staff, resigned during this period. (Clearwisdom.net) In 2006, The Epoch Times newspaper broke a stunning story about what is undoubtedly one of the most horrible atrocities to be committed by any government, not only in modern times, but in all of recorded history. As documented in the investigative report, “Bloody Harvest,” by noted human rights lawyer David Matas and former Canadian Secretary of State for the Asia-Pacific region David Kilgour, there is overwhelming evidence of the Chinese Communist regime’s chilling role in systematically murdering Falun Gong practitioners, harvesting their organs while they are alive, and making huge profits from doing so. In response to the international outcry, the Chinese regime has attempted to explain away one of the main pieces of circumstantial evidence–the meteoric rise in the number of organ transplantations in recent years and the extremely short wait times in a culture notoriously averse to organ donation–by stating that it has harvested organs from executed criminals after their deaths. Faced with undeniable evidence, it has attempted to escape culpability for a monstrous atrocity by admitting to a lesser crime. In this report, we will show evidence that directly contradicts this claim and lends further credence to the serious charges leveled against the Chinese regime. XIII. What you can do? “My God! I can’t believe this is true!” This might have been your reaction when you first heard about live organ harvesting. You are not alone. Sixty years ago, Felix Frankfurter, Supreme Court Justice, said something similar when he learned about the Nazi killing of Jews. Today we all know the unquestionable veracity of the Holocaust, the systematic killing of Jews in concentration camps by the Nazis. We tend to assume that when it was happening, the existence of the Nazi death camps was a well-known fact. People may wonder: how come everyone knows about the Holocaust, while few people know the inside story of live organ harvesting in China? Some have used the different reactions of the outside world as a reason to refute the organ harvesting allegations. As a matter of fact, when the Nazis were killing Jews, the outside world did not know about it at all, except for very few who were desperate to get the word out. Sometimes the descriptions were sketchy and conflicting. It was as hard then as it is today to get the facts out regarding the CCP’s taking organs from living Falun Gong practitioners. Karski: How One Man Tried to Stop the Holocaust gives a compelling story of extraordinary courage. Jan Karski, a Polish diplomatic courier, escaped a Soviet prison and endured Nazi torture. Karski snuck into the Warsaw ghetto and into a Nazi death camp so that he could witness the mass murder first hand. In 1942-43, Jan Karski reported on the extermination of Jews to British and American leaders. At the arrangement of Jan Ciechanowski, Polish Ambassador to the United States, Karski met Felix Frankfurter, U.S. Supreme Court Justice, at his first dinner upon arriving in Washington D.C. The following conversation took place after this dinner. The Supreme Court justice sat opposite Karski, looking into his eyes. Jan spent half an hour patiently explaining how his missions to the Ghetto and the camp had come about and precisely, in gruesome detail, what he had witnessed. When Karski finished, he waited for the visitor to make the next move. Frankfurter silently got up from his chair. For a few moments, he paced back and forth in front of Karski and the ambassador, who looked on in puzzlement. Then, just as quietly, he took his seat again. The CCP has consistently stonewalled outside investigations. It has guarded information related to death row inmates as state secrets. Efforts to analyze organ sources from death row inmates and living Falun Gong practitioners face a tremendous challenge. 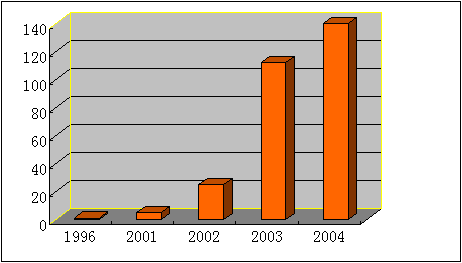 However, based on some public data and observations, the limitation of organs from death row inmates and the features of China’s organ market, especially with witness accounts from those with inside information, extensive telephone investigation, and testimony by organ mediation agents have all led us to believe that the drastic growth of China’s organ market from 2003 to 2006 has everything to do with organ harvesting from living Falun Gong practitioners. A single occurrence of such an atrocity, not to mention its appearance on such a systematic scale, amounts to a monumental crime. These are the most blatant reflections on the authoritarian regime’s utter disregard for life. When discussing the CCP’s human rights abuses, some people have cited China’s economic growth as an excuse. Economic development cannot serve as an excuse or cover-up of the CCP’s suppression of the Chinese people. It took Adolf Hitler less than three years to accomplish Germany’s so-called “economic miracle”. Hitler successfully reduced the unemployment rate to nearly zero from over 30%, which raised Germany’s international status and made it a European power again in short order. However, the killing of Jews in concentration camps has defined Hitler’s era. No one ever praises Hitler for economic growth during his rule. China’s growth in these years is much more fragile than that of Germany in the 1930’s. It has been achieved at the cost of environmental devastation, resource depletion, and moral collapse, a price that will be paid for generations to come. What it all boils down to is a society’s morality. If we do not raise our voices to stop such atrocities of live organ harvesting, China will have no future as a state or as a nation. We have seen that the CCP has responded to organ harvesting charges by regulating China’s organ market to fool the outside world, while strictly preventing independent outside investigations from being conducted in China. This blatant rejection of outside investigations is an indication that the CCP is involved in a cover-up. The CCP is also hoping that others will forget the drastic growth of China’s organ market from 2003 to 2006 against the backdrop of the all-out campaign to suppress Falun Gong. The CCP of the past cut Zhang Zhixin’s throat with impunity, just as the CCP of today can harvest organs from living Falun Gong practitioners. As long as the CCP, which is the source of decades of China’s misery, continues to exist, tomorrow’s victim could be anyone. Everyone can do his or her part, in gathering evidence, demanding that the CCP allow independent, outside investigations to be conducted, exposing the truth about this episode in history, and putting an end to the persecution of Falun Gong, the persecution of Truthfulness-Benevolence-Forbearance. If you are a doctor who has participated in harvesting organs from living Falun Gong practitioners, we hope you will not be blinded by immediate interests. Your involvement in live organ harvesting was brought about by the CCP. Without the overwhelming slanderous campaign and the policy of “beating [Falun Gong practitioners] to death will be counted as suicide,” the environment for live organ harvesting would not have existed. What has happened has happened. Keeping your lips sealed and guarding the CCP’s secrets cannot alleviate the gravity of these crimes or your remorse. By bringing out the truth, you can live up to your conscience, and reduce or even offset the crimes that were committed knowingly or unwittingly. It is the only way out. Three people with inside information made the allegations of live organ harvesting in March 2006. One was a senior Chinese journalist in Japan with the pseudonym “Peter;” another was a woman with the pseudonym “Annie,” whose ex-husband participated in removing corneas from Falun Gong practitioners; and the third person was an anonymous veteran military doctor from the Shenyang Military Area Command. Peter and Annie made a public appearance at a gathering in Washington, D.C., in April 2006. The specific crimes allegedly occurred at the Liaoning Provincial Thrombosis Hospital of Integrated Chinese and Western Medicine in the Sujiatun District, Shenyang City. On March 28, Qin Gang, spokesperson for China’s Ministry of Foreign Affairs, denied the charges for the first time–some 20 days after the allegations were made–and invited reporters to investigate on site. However, there was no record of this statement on the Foreign Ministry’s official website. On April 14, the General Consul of the U.S. Consulate in Shenyang City, accompanied by city officials, paid a pre-scheduled visit to the Thrombosis Hospital of Integrated Chinese and Western Medicine for an hour. A spokeswoman for the U.S. Embassy in China stated subsequently that U.S. representatives “found no evidence that the site is being used for any function other than as a normal public hospital.” Yet, this has not dispelled widely held suspicions that the CCP could have transferred inmates during the three weeks after the initial public exposure and conducted a cover-up. Sujiatun used to be an important military location. Back in the 1930s and 1940s, the Japanese Kwantung Army’s largest weapons warehouses were located here, and there was a sophisticated underground defense fortification system. Zeng Kelin, who served as the commander of the No. 16 Military Sub-region of the Eighth Route Army, recalled that, on one occasion when they opened up the warehouses in Sujiatun, they found enough weapons to equip an army of hundreds of thousands of soldiers. In one such underground system found in the Sujiatun District, the tunnels were about 7 feet wide and 6 feet tall, with a total length of about 1¼ miles. A visit to aboveground buildings would not disprove the existence of the underground tunnels. What the outside world is interested in is not the visit that took place three weeks later. They are interested in what the CCP did within those three weeks, as well what happened before public charges were brought against the hospital. Common sense tells us that the person who reports a case does not have to be the one who solves it. To demand that the reporter come up with all the evidence and solve the case is putting the cart before the horse. The Sujiatun allegations are just a lead supported by three people with inside information. The importance lies not in the absolute accuracy of their descriptions. What is important is the possibility that live organ harvesting has actually taken place. For example, someone passes by as a murder is taking place. He is at a distance and does not see everything. Based on what he does see, he believes there has been a murder, so he rushes to report the case to the authorities, which leads to a full investigation into a criminal organization. Was the person able to describe the crime scene with 100 percent accuracy? Did he know how many people were involved, who the murderers were, how many were killed, and what kind of weapons were used? It is unlikely that he saw everything, yet he still deserves credit for reporting the case. The Sujiatun allegations have lifted the curtain concealing this nefarious activity. People have started to pay attention to the tens of thousands of Falun Gong practitioners unlawfully held at hundreds of labor camps and other large-scale concentration camps. What happened to them? This series of reports has looked into the sudden increase in available organs for China’s organ transplant market from 2003 to 2006. It has attempted to find out where the organs could possibly have come from. The statistics support the allegations that organ harvesting from living Falun Gong practitioners has indeed taken place. On April 4, 2006, the Falun Dafa Association and the Minghui website published a notice announcing the establishment of The Coalition to Investigate the Persecution of Falun Gong in China (CIPFG). Governments, NGOs, media, and individuals were invited to conduct an independent, on-site investigation to gather evidence in China–without intervention–in order to comprehensively investigate the facts surrounding the CCP’s holding of Falun Gong practitioners in labor camps and secret concentration camps for persecution. In response to the invitation from Qin Gang, China’s Foreign Ministry spokesperson, journalists from independent media overseas started applying to go to China to investigate. On the morning of April 19, 2006, Xu Lin, a senior journalist in charge of news reports on China from Sound of Hope radio, went to the consulate general to apply to enter China to investigate. She was denied a visa. The following day, Zhou Lei, chief editor of The Epoch Times, went to the Chinese embassy in Berlin. Her visa application was denied. On May 2, 2006, Zhang Fen, San Francisco bureau director of New Tang Dynasty TV, applied for entry into China. Her visa application was denied. In June 2006, David Kilgour and David Matas applied for visas to enter China to conduct an investigation. Their applications were denied. The outside world is aware that the invitation from China’s Foreign Ministry was just for show. What is ironic is that those Chinese CCP supporters living overseas who have turned a blind eye to the CCP’s long history of killing are disappointed in the CCP’s decision to reject the visa applications, thinking it is an opportunity to discredit Falun Gong. According to their logic, if there is no live organ harvesting, independent investigators should be allowed to enter China since they would not be able to come up with any evidence, and the allegations would be disproved. Yet the CCP will not issue the visas. In response to the live organ harvesting charges, the CCP has not allowed any outside investigations and has categorically denied the charges. Bloody Harvest by Kilgour and Matas gives many accounts of solid evidence, including transcripts of telephone calls in which doctors from different Chinese hospitals acknowledge procuring organs from Falun Gong practitioners. After a period of silence, the CCP used Phoenix TV, its overseas media for united-front propaganda, to deny the charges in the TV program “Investigation of the [two] Davids’ Investigation.” The video shows doctors listed in Bloody Harvest making statements that actually turn out to support the evidence in the book, in addition to providing contradictory statements. The following are two such examples. Bloody Harvest uses data provided by Shi Bingyi, director of the Transplant Center of the People’s Liberation Army (PLA). The article “The bar has to be raised for organ transplantation,” which appeared in Jiankangbao [Health Newspaper] on March 2, 2006, quoted Shi’s estimate that there had been a total of 90,000 transplant cases in China [by 2005]. He was asked to make a denial on Phoenix TV, avowing, “I did not say that. Why? Because there has been no such number in my head.” It is known that Jiankangbao is the authoritative, organizational mouthpiece of China’s Ministry of Health. 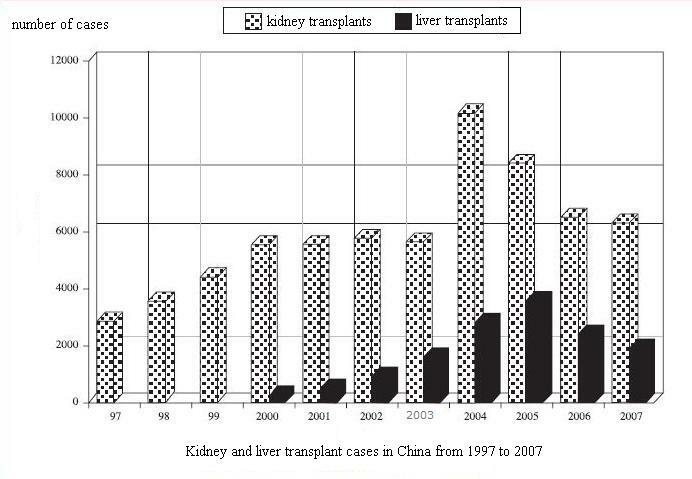 If Shi had not given the total of 90,000 transplant cases by 2005, instead of refuting Kilgour and Matas, he should have argued with Jiankangbao. In fact, Shi knows the numbers have been increasing and has thus been active in taking media interviews. 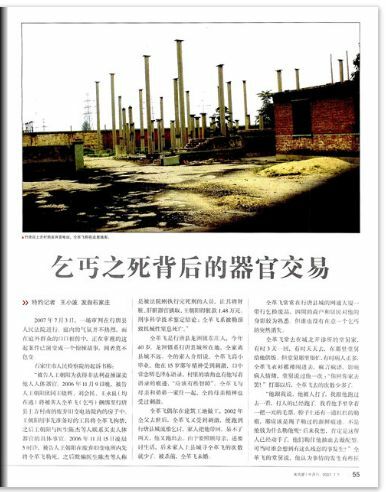 In this report, we have also quoted the numbers when he was interviewed by Science Times as well as Xinhuanet.com. Among the transcripts of telephone calls published in Bloody Harvest, one was a conversation with Lu Guoping, a doctor who worked at Nanning City Minzu Hospital and acknowledged the use of Falun Gong practitioners’ organs (see Chapter XI). In the Phoenix TV program, Lu was asked to deny what he said. However, Lu first admitted that it was he who took the telephone call on May 22, 2006. Kilgour and Matas consider this supporting evidence to the original telephone recording. Prior to this, the main doubt people had was whether it was actually Doctor Lu Guoping on the other end of the line. His identity has now been authenticated by the Chinese government. 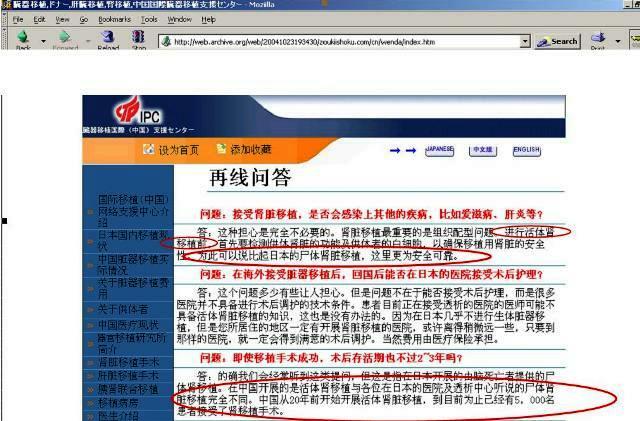 In a follow-up report by New Tang Dynasty Television, snippets of Lu Guoping’s speech on Phoenix TV were shown. Viewers were able to compare the voice on Phoenix TV with the original investigator’s phone conversation (see Chapter XI for links); both have the same pronounced dialect, which is hard to fake with current computer technology. 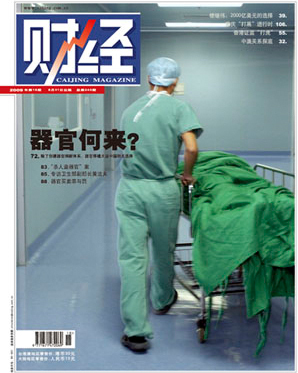 After March 2006, the CCP expedited the overhaul of China’s organ transplant market. It issued a qualification regulation, reducing the number of transplant hospitals to 164 from over 600. A temporary regulation on human organ transplants went into effect on July 1, 2006. On May 1, 2007, the (permanent) Regulation on Human Organ Transplantations took effect. The international community welcomed regulations over and management of China’s organ market. However, the introduction of regulations does not negate the crimes committed in the previous years. Simply brushing off the prior period by describing it as “chaotic” and praising the new regulations is nothing short of assisting a cover-up. 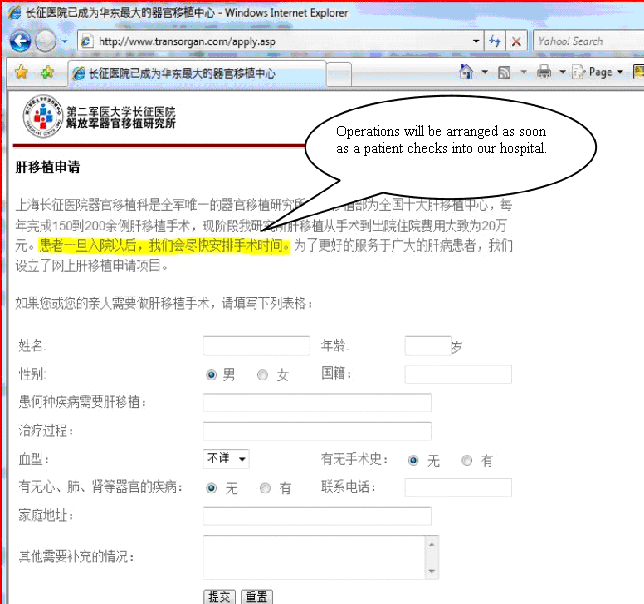 At the same time, the CCP closed down the websites of certain organ transplant hospitals and related organizations. The website of the Chinese Society of Organ Transplantation, affiliated with the China Medical Association, is one that disappeared. It went offline in March 2006 and has remained inaccessible as of November 2009 (see Appendix 10 for details). Also, major hospitals have removed statements regarding the extremely short waiting periods (as short as a week or two) that had been listed on their websites. 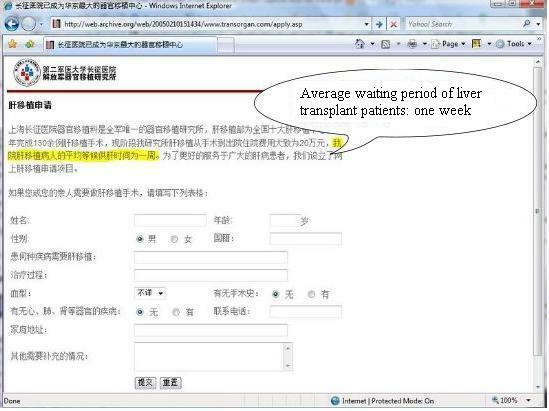 And, the CCP has called off organ transplant tours targeting foreign organ recipients. We cannot help but ask, what is the purpose of removing or changing the content of these websites? What is being covered up? Note: Much of the data and relevant information cited in this report has been taken from Internet archives at the website http://www.archive.org, which is evidence that is outside the control of the CCP for deletion or revision. The CCP had been quite clear and consistent in denying the use of death row organs. In March 2006, Qin Gang claimed in a press conference that reports of organs being removed from death row inmates in China were complete lies that had been fabricated to mislead the public. On April 10, 2006, Mao Qunan, a spokesperson for the Health Ministry, denied overseas media reports that China arbitrarily took organs from death row inmates. He claimed that the primary source of organs in China was volunteer donors upon their passing away. However, on August 26, 2009, China Daily, China’s official English newspaper, made a high profile admission for the first time that executed prisoners were currently providing two-thirds of all transplant organs. This was interpreted by the international community as the official number backed by the Chinese government. However, the CCP’s transition from categorical denial of the widespread use of organs from death row inmates to a high profile admission took place as serious charges were being brought against it: procuring organs from living Falun Gong practitioners. How can people today believe the CCP’s denial of these serious new charges any more than its consistent denial of using organs from executed inmates? Some Chinese organ transplant experts tried to increase the reported percentage of organs from executed prisoners as early as 2005. We cannot tell whether their purpose was to make public the use of death row organs or to cover up an even greater crime. However, the latter is a strong possibility, since these experts have been well aware of the facts of harvesting organs from Falun Gong practitioners. Admitting the wide use of death row organs and denying allegations of organ harvesting from living Falun Gong practitioners, while resolutely opposing any independent investigation into these allegations, is the CCP’s current stance. Its overly high profile campaign to reform death row organ procurement and its overly sensitive attitude to charges of live organ harvesting indeed raise suspicians of a systematic cover-up. 6. Another peak in organ transplants? The establishment of an organ sharing system across China, the legislation to allow organ donation from brain dead patients, raising awareness of volunteer organ donation, and encouraging donation among family members may end up expanding China’s organ market to surpass the large figures from 2003 through 2006. Given China’s one and a half million patients waiting for organs, organ transplantation will continue to make headlines. Experts and scholars are expected to join the media effort to promote and extol the new rules and regulations. Through these efforts by the CCP, will the crimes against Falun Gong practitioners killed for their organs be covered up and forgotten? During the drafting of this report, the authors have been reminded by kindhearted people that the CCP may publish carefully manipulated data to defend the skyrocketing of China’s organ market during the years from 2003 to 2006. Regardless, given the fact that the CCP instigated the persecution of Falun Gong in the first place–and on such an unprecedented scale and with such cruelty–which led to allegations of live organ harvesting, any further actions the CCP takes can only diminish its credibility in the eyes of the Chinese and the world over and ultimately accelerate its demise. If some people still question whether doctors could engage in harvesting organs from living Falun Gong practitioners, then let’s take a look at some other cases. Chinese media have reported two instances in which doctors were suspected or implicated in killing a beggar and a homeless person in order to procure their organs. These incidents raise the question of which is more valuable in Communist China: human decency or human organs? South Wind Window magazine (Issue No. 14, in 2007) published a report entitled “Organ Deal Behind the Death of a Beggar.” Tong Gefei was a beggar from Xingtang County, Hebei Province. The magazine reported that local resident Wang Chaoyang was alleged to have conspired with Chen Jie, a post-doctoral researcher at Tongji Hospital in Wuhan City, Hubei Province, and several other doctors from Wuhan and Beijing. The doctors spent about 20 minutes in a deserted electrical power substation. The operation was performed under the illumination of several flashlights. They harvested Tong’s liver, spleen, pancreas, and two kidneys, a total of five organs. A doctor later surrendered himself to the authorities. Chen Jie of Tongji Hospital paid 65,000 yuan to Tong’s family in compensation and expected his family not to implicate the doctors. It was reported that Wang Chaoyang lied to the doctors, saying that Tong was a death row inmate. However, all the doctors involved in this case should have known that to procure organs from a body, an official death certificate issued by the courts has to be presented, as well as a statement of consent from the donor him or herself. Of course, there were no such documents. If a death row inmate is executed, surgery to procure the organs takes place on the execution grounds, as the procedure has to start within a minute of the victim’s death. Defendant Wang Chaoyang confessed at a court hearing, “After the procedure was underway, Tong Gefei suddenly raised his arm and grabbed a doctor’s shoulder. Another doctor stepped on Tong’s arm. The surgery was soon over.” This can only be described as live organ harvesting. The report in South Wind Window portrayed the case as “an extremely horrible story, which will alarm anyone who hears about it.” (See Appendix 11)  Many people were unable to believe that doctors could engage in such a despicable act as harvesting organs from living people for monetary gain until they learned about this case. Doctors are supposed to fulfill their duty to save lives. But as seen from these examples, driven by money and fame, some have become ruthless, willing to kill those whose lives they consider worthless (which includes beggars, the homeless, or those considered enemies of the CCP) just for their organs. These cases dispel the notion that organ harvesting from living Falun Gong practitioners requires sophisticated medical equipment. In fact, that is not necessary. As mentioned above, the killing of beggar Tong took place in a deserted electrical power substation lit up only by flashlights. Some people remain incredulous of the live organ harvesting that Falun Gong practitioners have fallen victim to. With regard to the substantial increase of organ transplant cases, conventional thinking has driven these people to search for an answer among the donor source of death row inmates. Some have even broadened the concept of death row inmates. Then which groups of people fit the broadened definition? The following conversation, though fictional, accurately frames the issue while illustrating how many people try to avoid dealing with it. A: The CCP has done a lot of things wrong. Still, it’s unlikely that they would harvest organs from living Falun Gong practitioners. After all, times have changed. B: Times have changed–and things don’t necessarily change for better. Haven’t we had to deal with lots of fake products of poor quality? Poisonous food, poisonous milk powder for infants–these things are fairly recent. Put lowered moral standards and greed together, and what terrible things won’t they commit? And speaking of organ harvesting, where have all these kidneys and livers come from? A: Who else other than death row inmates? It’s an open secret. Taking organs from living Falun Gong practitioners is too incredible. B: Isn’t it more incredible that the waiting period for organs is several years in developed countries, while in China it’s only a week or two? How can something that incredible take place in China? A: In China, things are rather complicated. You can’t use the narrow definition of death row inmates, that it is only those sentenced to death and executed with bullets. Let me tell you, it is really easy for prison inmates to die, not just those who are on death row. Beat them to death, and they become death row inmates. This is a broadened definition of death row inmates, isn’t it? Simply beat them, beat up the ones who the guards don’t like or those who are not well connected. When the inmate is close to death, he or she is carried to the hospital for organ harvesting. It’s even simpler than removing organs at the place of execution. You know how crafty some people can be. Like you said, driven by greed, what terrible things won’t they commit? B: What you described are isolated cases. The increase in organs had to account for a large number of people beaten to death. It would have to be group after group of prisoners killed. A: Think of it this way: Those who are well connected won’t be thrown into prison. The ones who end up in prison are among the vulnerable social groups in society. They have no power or influence whatsoever. It costs nothing to kill them. No court even takes up cases related to their deaths. B: You mentioned vulnerable social groups in society. Which group is most vulnerable at present? You can’t find any more vulnerable than Falun Gong practitioners, considering the way they have been slandered and have been deprived of their political, economic, and legal rights. The CCP has taken Falun Gong as its Number One enemy. Overwhelming propaganda in state-media has smeared practitioners to the extent that no matter how they are mistreated, no one is allowed to speak out for them. In addition, the number of practitioners unlawfully arrested is at least in the range of tens of thousands. Doesn’t your broadened definition of death row inmates apply most fittingly and most conveniently to them? A: Well, if you look at it that way, it could very well be the case. It was April 2006, shortly after the exposure of live organ harvesting from Falun Gong practitioners, when CCP leader Hu Jintao visited the White House. The Chinese Embassy in Washington D.C. organized a group of people to greet the delegation from China. Across the street, protesting groups were gathered, including many Falun Gong practitioners who demanded a thorough investigation into the alleged live organ harvesting. One news reporter from the Western media asked the organizer of the Embassy’s welcoming group for his comment on the over 2,000 people protesting the visit right across the street. In any county, things as wicked, cruel and serious as live organ harvesting are things the highest leadership of the nation would be informed of. Any reasonable government would order an independent investigation immediately to get at the root of the issue. But simply because the victims are Falun Gong practitioners, this organizer did not have the least bit of sympathy nor the least respect for life. His “joyful moment” was more important than the life of a fellow citizen, due to the fact that this citizen is part of a peaceful group that is being targeted by a nationwide propaganda campaign. This type of mentality has, in turn, facilitated the crimes of live organ harvesting. About 400 years ago, Sir Thomas Gresham, a British financier, made an interesting observation that “bad money drives out good” under legal tender laws, that is, when there are two forms of money in circulation with similar face value, people will collect the ‘good’ coins made of more precious metals and use the ‘bad’ coins made of cheaper metals as payment. Soon all the coins in circulation are ‘bad’ coins. This is known as Gresham’s Law. Under the unprecedented persecution, Falun Gong practitioners, who have followed the principle of Truthfulness-Benevolence-Forbearance, have been demonized as “bad money.” The CCP had already indoctrinated the population with atheist propaganda for decades. Many people find it hard to have spiritual beliefs because the CCP has labeled them all as “feudal superstitions,” and believers are thought of as fools. The overwhelming CCP smearing of Falun Gong practitioners, for example, accusing them of “committing suicide,” “killing others,” “self-immolation,” and “being mentally deranged,” has fostered hatred against them in society. The CCP regime went on to label Falun Gong practitioners’ efforts to spread the facts about the persecution as “disrupting order by anti-China forces and reactionary organizations.” These political labels have further damaged Falun Gong practitioners’ reputations. During the persecution, police officers and detention center, labor camp, or prison guards have not been held responsible after torturing practitioners to permanent disability or beating them to death. Practitioners have been prohibited from appealing to any levels of authorities, and have been arbitrarily dismissed from work or expelled from school. Practitioners have not even been able to hire attorneys to defend them because the few attorneys who have stood up to defend practitioners have faced persecution themselves. Falun Gong has been under fierce attack not only in work units and government organizations, but even in textbooks used in elementary through senior high schools that have been revised to carry dedicated sections demonizing Falun Gong and slandering practitioners. In labor camps and prisons, all other inmates have advantages over Falun Gong practitioners. It is not uncommon for death row inmates to be assigned to monitor practitioners in prison cells. Practitioners are deprived of any and all fundamental human rights. One inmate who was released from prison told a chilling story. An elderly Falun Gong practitioner refused to renounce his belief and was tortured. He went on a hunger strike to protest. After he became extremely weak and his condition deteriorated, the guards dragged him to the hallway and left him there. Guards simply walked by, completely ignoring his existence. For days the elderly practitioner lay in the fetal position, his life withering. When he passed away in silence, he was carried away. This was the end of a life. This exemplifies the indifference and contempt of those carrying out “law and order” on behalf of the CCP. When a college student was beaten to death in a temporary custody house in 2003 for not carrying and presenting his identification paper, there was outrage over the Internet against the custody and repatriation system in China. However, little has been heard over the brutality of this all-out suppression of Falun Gong that has lasted for a decade, impacting millions of innocent people. People do not believe that the abuse, torture, and killing have taken place on such a scale. When confronting charges of live organ harvesting, many are in self-denial without looking further into the issue, only because the victims and plaintiffs are Falun Gong practitioners. This unwillingness to look into this serious matter has, in turn, contributed to the persecution’s taking place and continuation. It would appear that CCP operatives suspected of killing Falun Gong practitioners figured that it was a lot more safe and convenient to harvest organs from Falun Gong practitioners, as in the current political climate they have been absolved of all legal responsibility. These live, low cost organs from young and healthy Falun Gong practitioners drove out the more costly organs from other sources per Gresham’s Law. The lies and slander spread by the CCP state-run media have created the environment for harvesting organs from living Falun Gong practitioners. Who makes up the broadly defined death row inmates? Falun Gong practitioners, treated as the Number One enemy by the CCP and unlawfully arrested and imprisoned on a massive scale, fit the broadened definition of death row inmates more than anyone else. Gresham’s Law also hints that during these years of persecution, it is likely that the organ source of traditional death row inmates could be on the decline, whereas more organs are being taken from living Falun Gong practitioners.